On October 4th, q-leap gathers the Luxembourg community of software players for the 4th edition of the Luxembourg Software Testing Event. Driven by the latest developments in the mobile application market, which is experiencing unprecedented growth and a marked evolution in software testing practices, the Luxembourg Software Testing Event (LSTE) gathers all the testers, QA, and digital practitioners from Luxembourg and the Greater Region. “The era of Digitalization has made users particularly demanding. A single bug can have a critical negative impact on businesses, leading to huge financial losses that can amount to several million euros per hour in certain sectors.” comments Sylvain Perez, CEO at q-leap, the software quality company who organized this event. Non-functional requirements and the real value of the Testing, the importance of having an UX Quality Assurance approach for Digital products, fit Performance Testing with DevOps. This 4th edition of the LSTE will meet the challenges of testing in all industries. « Beyond the buzzwords that are constantly heard in all organizations, some issues such as performance measurement or usability of applications are not always addressed. 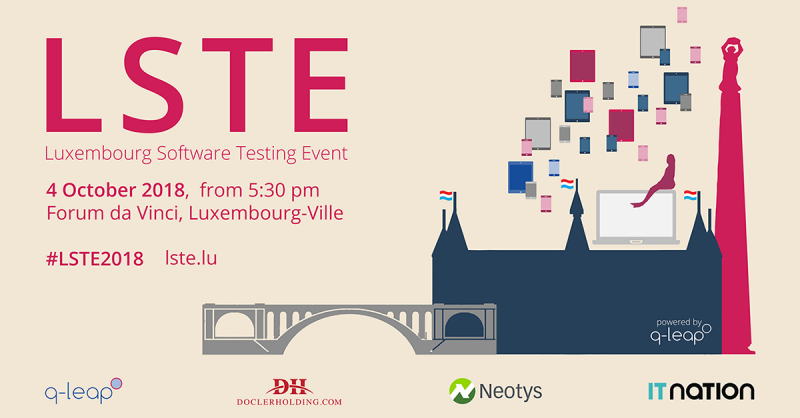 The Luxembourg Software Testing Event is an opportunity to highlight these types of tests often forgotten but so important for the end-user experience. » explains Julien Desmulier, Head of Testing at q-leap. For this event, the LSTE will hear from personalities such as Federico Pizzutto – UX Expert at Docler Holding; Stephan Kehren – Senior Performance Engineer at Neotys; Sylvain Perez – CEO and Dennis Monteiro – Head of IT Governance and IT Project Management at q-leap. They will be up on stage to address and share the specific challenges posed by testing in a Luxembourg economy that has made digital transformation its priority. By organizing this conference thanks to sponsors Docler Holding and Neotys, q-leap pursues its objectives of exchanges and reflections in the field of Testing and Software Quality. The software quality company still fully involved in the movement of digitalization of organizations in the Grand Duchy. This conference will take place at the da Vinci Forum in Luxembourg City, from 17:30. Registration is free, although space is limited, so act fast and register early to reserve your spot.